Home » Bright Side of Life! In a world which constantly tries to bring us down, media that reports only strife and conflict, it’s easy to lose sight of things that matter. This is my attempt at remembering to count my blessings! A gift, not given to me, but meant for me. Hee hee… A house in Madrid, away from the noise, with a garden and a pool. No, dreams are not impossible to achieve. An early morning surprise. Great company makes for shorter journeys. Top down, music on, getting tooted at while driving. I’ll take that as a compliment to Hermione. Listening to music I’d like to play on the harp. Coming home, trying it and feeling it possible. Mass at OLM. A family of 4 with the Dad and 2 little boys dressed in waistcoats. Another little kid with braces. Love, so much love. That’s what being with my tribe does. Be in my bonnet? A spontaneous plan to wear hats for Easter. The details falling into place. A few hiccoughs and nothing more. A surprise that was a surprise we planned. Midnight Bodhrán classes. After alcohol and dancing and off-key singing…. not all that bad! Spring morning. Simpsons clouds in the sky. Fresh mountain air. Birds song accentuated by a stork spreading it’s wings in the soft morning light! Breakfast after a quiet morning ride into town. Feeling that I’m finally getting a hang of my instruments. Cold case, finally solved. Champagne called for. DB superhero. Human errors need a superhero’s solution. A little chat. That’s all it takes to make the day worthwhile. My gorgeous new Yellow coat. Shades required. Compliments from a reserved person. Body, mind, soul! Nourished. No one left behind. We’ve always had a matriarch. But in her absence no one gets left behind. Plans. So much to do. So little time. Past. Present. Future. Everything is now. Morning @ OLM. So much love. It’s so refreshing to go back to church and be in the presence of God and friends. A surprise lunch with Alex and Dani. Wei. It’s the company that makes everything worthwhile. Welcome back, L’s angel! Snow and sun. The very earth was humming. Got my hair done. Love feeling this good. They really are a girl’s best friends… when diamonds aren’t around! A warm, cozy bed. Blessed. A huge slice of chocolate cake for postre. Being told I was dressed like David Bowie and once the hat was on, a reference to Peaky Blinders made the rounds. Talking stick. No rude interruptions. No dramatic pauses. Long morning shadows. So many opportunities for photos. Signs of life everywhere. Love walking around, talking to the trees in my garden. Music. It makes sense again. An ex-colleague got in touch and his evolution and the similarities between our lives and thinking made me realise…. Tribesman! Solving every issue even though some weren’t ours to solve. Happy kitty. Wish she’d stop showing her gratitude with her claws and teeth. Until we meet again. When it gets cloudy, the sky works a huge softbox. Loved taking my camera out to shoot in my garden. Top notch guac. So proud of me. Sleeping in. Fashion show. A private one too. I’m gettting better at dressing others. Conversing about so many beautiful things. And not so beautiful things. Reaching work early enough to get a chance to shoot some gorgeous trees. A little boy worried about my car having no roof. Blossoming Olmos. Didn’t know they were so beautiful. A hug. A perfectly tuned harp. “I love you, ma.” I know how difficult it is for my dad to talk about his feelings. So glad he’s willing to stammer out that line. Mum always said beta, he says ma. A promise I made. And one I’ll keep. Breakfast and lunch. I was so surprised to get to share it. Instead of plugging in, they decided to go acoustic. Some great music. Some wonderful conversations. Musically inspired shoot! Some of my best macros were inspired by guitar strings. Being understood, accepted and permitted to be. Earth angel. One of my favourite songs that still rings as true as ever. Playing stylist and doing it well. Being cool. A car like Hermione doesn’t deserve any less. Being. Just being. A full moon hanging low as I drove in with the top down and music filling the air! There is hope! Calling Dad to wish him again after my sister hijacked my first call. The gift of giving. Plastic Jesus. A version that made me want to dance. Amnesia… St Pat’s day after effects. Laughed so hard when I had to recount the entire evening. A perfect script. Work can be fun. Harp lessons. So much to unlearn. So much I’ve learnt well. Meal. Mead. Music. An invitation for St Pat’s day that turned out to be absolutely fun! A chance to be there to help and support a friend. A promise. Enough said. Found a little shop that sold the most quaint knick knacks. The flowers were gorgeous. Got a spring bunch. Got roses and carnations for mum. Driving with the top down. The sun on my face. The mountains in ahead of me. Light in the hair of a redhead. Sunset painted the sky so many lovely shades. 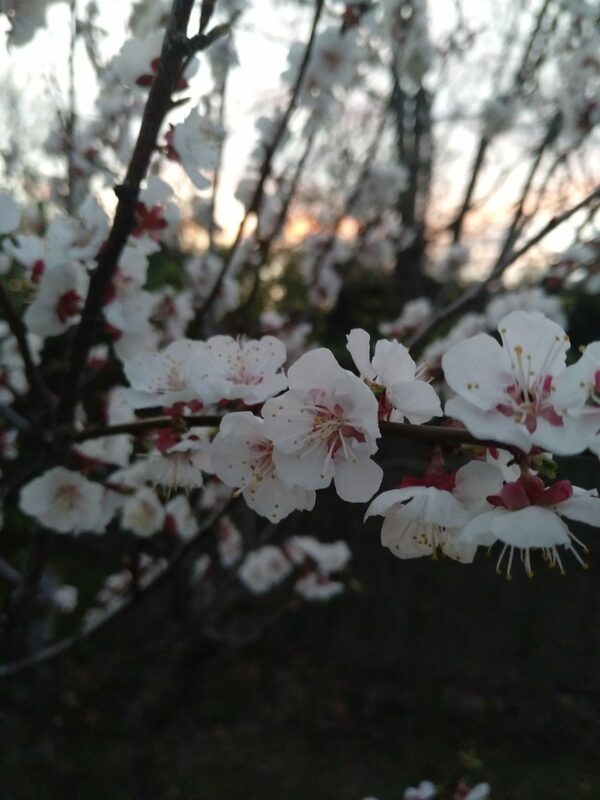 Apricot blooms… white against the golden sunset. Lunch was the question. Yes, the answer. The yellow-orange in my hair made her think of a ‘Gallo’… but I’m sure she meant it as a compliment. Making plans. Concerts. Trips. The future. Finding my mojo after months. Camera in hand, tree as a background. Convertible weather. Top down. New shades to debut. So glad mum picked them for me. Great company. Not something found easily. Black truffle flavoured potato chips. Slowing down & taking care of myself. A series that managed to get my attention. Especially the start. The song J sang for the Ash Wednesday mass. Moving. A smile from the priest on seeing me at church. Not going to service alone. Such pleasure. Several different, difficult changes. So glad it worked perfectly. Stopping at a different pet shop in town and being amazed by it’s size and variety. I might get me a birdhouse. The aroma of Anglo-Indian Roast. hmmm…. Finding out their favourites without them uttering a word. A group video call with the sweetest cousins one could hope to have. Taking in the sunshine and a pint. Gossamer goddess…. I like the name. Flowers peeking through the gaps between stones. New words – Petrichor, bellicose. Interesting. Kindness… a colleague who asked how I am doing and gave me a motherly kiss on my cheek. A scarf my neighbour gifted me on her birthday. The painting that filled the house. Big eyed, little girl. Breakfast for lunch. Satisfying, including the Ski jumping on tele… fabulous until the stag party arrived. Layers, buzz cut, parting. Glad I know how those translate to a hairstyle. Bohemian Rhapsody. Now that was worth it! Knocking it out of the park at work. Love doing so well. Sharing mucky, groundling jokes. Raising a glass with one who is off the wagon. Lovely weather in the mountains. Cherry jokes. A clean bill of health. A large full moon peeking over the hills. Checked out a new museum. So much to explore in this city. Gave a gift. Received delight that will light up my world for a long, long time. Lilac. My colour. Sharing tales and photos of our tributes. It made me laugh. It made me cry. Mum loved to dress up. She’d pleat her sarees to perfection and wear pearls or gold. And yes, her trademark brooch. Today, as we celebrated her around the world, we did so too. We dressed in what could be called our Sunday best! Reading suggestions. Given and taken. From Accursed Kings to Ursula Le Guin…A pair of dogs that were taking a walk. Tiny, fluffy and identical.Dinner with my tribe! Oh the joy! Sunrise, a little diamond peeking through the 4 torres. 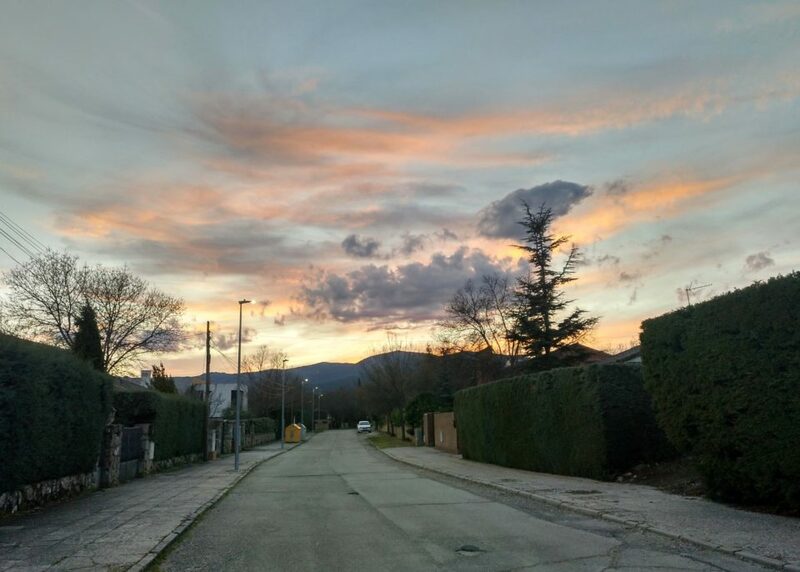 The setting sun painted the sky the way a romantic era artist would wield his/her brush! Finding some old photos of mum. She was such a joyous creature. Releasing toxic people. People who use death as a joke only to fish for compliments. I know some of the punch lines, but I never did watch a whole film. Monty Python and the meaning of life … for the first time…. An old lady who dressed for the times and put many a young girl to shame. Olé! A mouth watering pork recipe created from a fusion of cuisines around the world. Wee bit tweaking needed, but I think we have a winner! One cousin who got my mum’s name on the cake for his kid’s FHC. One who cooked several curries for my Dad to make sure he had the variety he was used to. Another cousin who had long stemmed roses placed on mum’s grave. Warm winter day. Perfect to put the top down. An absolute feast. Lunch is served! And dessert … wow! Knowing. The right choice. The right life. The right path. My first day of work and I was informed that a raise came my way. Not a bad way to return to work. New monitoring tools that give us more insight into our setup. Simple and beautiful. Routine. Lunch…. When life as you know it ceases to exist! A perfect winter morn. Gorgeous sunrise colours and flocks of birds that filled the sky. She finally came out of her shell. On her last day. Lol. Despite a perfectly horrid day. There were moments of peace. Moments I’ll treasure…. Amazing food and after all the work that went into it…. menos mal! A family photoshoot that changed into an impromptu use of my 50mm. Gorgeous lens that! So many gifts … and all so gorgeous! I’m blessed! Yellow lanterns against an indigo tinged cloudy sky. Spoke with the b’day gal after so many days. Love the silly, sweet, deep topics we navigate through. A concert of 2. A melodious alto harmonising perfectly with a rich baritone…. The sky was every hue imaginable. Lovely company and great vistas. It’s a hard life! Going live during the jam session and listening to the most gorgeous version of Knocking on Heaven’s door. Gaudete Sunday. Pink everywhere. The crib and the lights and the gifts under the tree. The kids running to help out with piling the gifts in the car! A huge, huge, huge rainbow that crowned the entire valley. Bob was out to please. Early morning, bus rides, nap time too. Whoo hoo! A little girl who saw my car and wanted it bad bad bad…. at least that’s what she told her dad! Whiskey, Fire in the fireplace and a conversation on everything. Boss out. I’m da man. Again. My red boots. Love wearing them and having people do a double take. Listening to live music. Can’t imagine life without it. Alternatives to G+…. we’ll find it! A hug from Pepa. Her face radiating the relief her surgery provided and the joy she felt at being back. Socks to keep me warm. Surprise shopping trips. Monk vs Rover. Rover won. Mass made me smile today. God is always working in our lives. We just need faith. Was so glad to run into so many familiar faces. Made Matar Pulao. Could definitely do better, but the aroma…. took me back home. Played the harp for several hours. It felt like the right thing to do on a day as glorious as this. Loved the shadow of the strings and my hands. Tuned it to Eb Major. Let the serious studies begin! A crescent moon with Venus right above it. Made me stop and smile and reach for the camera. Trying some images that I’ve had in mind for a long time. So much more to try. So much more to learn. First things first. The Advent calendar. A something special this year is a “Musical Advent Calendar” that my friend has decided to share with me. Cleaning before the decoration. Seemed a Herculean task, but hey, someone had to do it. A chance gesture of kindness which resulted in a wonderful afternoon…. Bus rides and interesting conversations. Now that’s something I wouldn’t give up on. The urge to clean smothered by my body’s craving for some rest. The decorating will have to wait. Playing sequence and watching the game go three ways. Less of luck and more strategy in this one. J noticed my tan. And everyone noticed the fact that I looked relaxed and rejuvenated. Felt it too. Their reaction at receiving their gifts. Lunch. Wow. Promises. How they make one’s eyes light up. Spent the day packing and realising that there is so much I can do without. We surround ourselves by so much. Lose ourselves in it. And only too late do we realise that we’ve hoarded up treasure that we never really wanted or needed. Wanted to see D before I left…. Finished several projects with one day to spare. Glad I’ll be heading out without much pending. Player. He Played. I Played. He got the applause. I got the compliments. Hee hee … Pity E couldn’t come along to add to the surprise. Wore a long heavy coat thinking I might just be over prepared for the day…. watching the others shiver, all I felt was warmth. Warmth and good conversation, that’s all one needs to start the day with a smile. Switched to handmade cosmetics today…. After weeks of insomnia, I finally caught me some shut eye. Rested and rejuvenated. So ready for my trip. Friends came over to wish us luck. Lunch included an Indian dish that I had never tried before. Ah the joys! Finally getting down to finishing some automation projects. Loving it. The double bass that S played. Wow … such a lovely instrument. Can’t wait to hear D and J pull off a number together. They’ll bring the house down. She called me her muse. Her reason for coming back to class. Also the same day that I realised that I have a muse. How could I have been so blind. A full moon… tides, werewolves and everything mystic. Barely getting to the bus station on time and seeing Bob work some early morning magic. He’ll make a believer of me. Lunch. Who knew 1 hour could be filled with so much life. Feel it pulsing all around me. Thank you. The cathedral in Santo Domingo de la Calzada. The real chickens and the story around them. A message from H on how grateful he was for the break and the company. We really need to keep in touch a lot more often. The view of the Zaragoza cathedral from the bridge. At night or during the day. It’s always a pleasure. Listening to a band play while we were photographing it added so much to the day. Goofy photo-shoots after a serious one. Seeing the expression of disbelief on the face of the person who was auditing us. Apparently we are one of the few organisations audited who have centralized monitoring. Really? iptables to the rescue. Block them all. Loved the class…. My lovely, pink, floral dress that I couldn’t fit into 2 weeks ago. Such a delight. Driving into a red roofed town, highlighted against a green canopied valley topped by peaks scudded with white rain-laden clouds. A rainbow in the valley…. Prayed for a little miracle when it came to getting a discount on a fine being paid late. Miracle granted 😀 A co-passenger changed his seat thrice to come sit beside me. Banal talk followed by compliments, followed by crazy anecdotes. A msg that read: Darling, you are a Goddess. And once you know what that truly means, I pray for anyone who tries to hurt you. Give a smile, get a smile. The normally irascible receptionist finally cracked a smile. Geoserver. Now we’re talking. Can’t wait to experiment more. A concerned colleague who couldn’t believe that I take my break so late. Felt strange. Strangely good. A video call that helped me realise how lucky I am. I have someone willing to listen…. Worked from home today. I have no idea why any company will be against their employee’s benefit. Logic triumphed. Feels nice especially since I got to the right answer before anyone else. Surprised a friend.. and myself. A server that has transmitted 1.4T of data and is still going strong. We should learn to brag. That too on the day that PRC has been found secreting chips on tech sold to other countries. The Woman who hides kaleidoscopes in her shadows. Instead of taking a lunch break, I took time to finish my visa application. Hate having to waste so many resources, time and money. We need a world with no borders. Fixed an outstanding issue by just paying attention to what was spoken…. Art – Paintings, Stone, Voices, Views…. Just a stone’s throw away from the house. What wonders… what joy… what beauty! Had lunch at a little local restaurant. The real deal. Spanish food, village rates… So glad we got to try it out. Visited Madrid as a tourist once more. There is so much to see in this town. Met the lady who translated some documents for me. We got on like wildfire. O’Neils O’Brians … different name… same goodness. My first experience getting a car towed. The process works so well here 🙂 Visited Segovia. Almost forgot how amazing the place is. The cathedral is more beautiful than ever. Took fewer images, worked more on composition and light…. Being the girl watching the men cook. Ah the joys of life. Neighbours who came over for lunch and laughs. Always such a pleasure. 2 sisters who took their vows of poverty. Such joy. Such life. Love African celebrations…. The basic chords ADG. Still doesn’t let me play the blues, but poco a poco. Got rid of my screen protector and my phone feels like new. Also got rid of a memory. Little things do make a difference. Therapy for the soul. That’s what Saturday was. Filled with my favourite things. Acoustic music and an introduction to several new artists. An impromptu photoshoot. A place that uses bellows to serve cider. Love it…. Wore a black and white wrap today. Loved how simple yet elegant it is. (not my words.. lol) Watched a Flamenco class while debating whether it’s the dance for me. It might just be… apparently i have the attitude. Wore a new dress today. Love it when stuff I find online looks as good as I expect. Plenty of accidents in Jarrama, but it was still fun. Sunshine on Leith …. hate when a movie gets to me…. Telling your hairdresser to surprise you may go either way… Too much trust, but the good thing is it will grow back. Decided on keeping my heels on for the whole day cause it felt like it. Never a bad idea. Downgraded, upgraded, switches, backed up and restored Git today. So much to learn. Being told that my Minnie mouse dress suits me well. Designers compliments count for more. Played around with iptables. Diced with locking ourselves out… but didn’t! Learned so much about KVMs and Magento. Phew… major heartburn cases. Received my dresses. Am absolutely certain I won’t be shopping here ever again. Good thing this shop is off my list. Discussing style, dressing and shopping options with Lorelai…. Learned something new. Always something new to learn. A strange comment from a colleague made me realise that we may be a bit too overbearing for a few. A bit more humility will not be too much to ask for. My gorgeous black and white dress which got me so many compliments … the one that stood out … “I love that dress, especially since I’d never be able to wear something like it”. A kid with purple hair and her fabulous pets….